Submitted by peter on 28 December, 2007 - 00:17. In the Toyota Altis detailed preview article I made a few guesses that turned out to be right. But that article was written in March, and if it had all been accurate, I would start a new career in gambling. One thing that wasn't accurate was the launch date. I expected the Altis to launch in October, or at least in time for the Thailand International Motor Expo in November. Now as the year draws to an end, it seems that the 2008 Altis will not reach the dealerships until January with deliveries starting in February '08. But there is something else I may have been wrong about, and that was my guess regarding Toyota's choice of engines for the new Altis. I fully expected that Toyota would go with the new Dual VVT-i engines. The 1.6 litre and 1.8 litre Dual VVT-i engines put out 124 hp and 140 hp respectively and would have offered better competition for the Honda Civic with its 140 hp 1.8 litre VTEC. This would have been the logical way forward, so I thought. But it seems that Toyota sees no need to update the 7-year-old engine technology from the current Altis if a preview marketing pack I viewed today is to be believed. This means that the VVT-i 1.6 and 1.8 litre motors from the current line-up will remain. But producing 109 hp and 132 hp respectively compared to the current model at 110 and 136 hp. This would be disappointing if it is for sure, but it shouldn't come as too much of a shock that Thailand doesn't get the latest and greatest Toyota has to offer. Toyota has developed a reputation for quality in Thailand that is unmatched in the industry. The Altis has become the car of choice for Taxi companies and independent Taxi drivers alike. Frankly it wouldn't matter what engine they put in there (as long as it conformed to the regulations for Taxis of course) the Altis will always sell in massive numbers to be re-sprayed and have a radio and meter fitted. It'll have great water jets though!! So Toyota has decided to use a less than exciting engine in the Altis, big deal? It's not like it was ever going to go for the youth anyway, and the acceleration and performance will still be enough to make it an enjoyable car to drive. Toyota brought out the Yaris and Vios with the same 1.5 litre engine that dragged the old Soluna Vios around, and at the time I couldn't help wondering if the engine development at Toyota is really so far ahead of the game that they can run the same unit for 6 years, and then continue with it in a new car for another 6 years! Leafing through the marketing folder in a Toyota showroom it was obvious that the Civic was the rival being targeted here. Many pages featured side by side comparisons - with large colour pictures - of the Altis and Civic. Each time this was done, there was large print declaring "Altis Wins". Examples of this include the turning radius, the stopping distance from 100km/h to 0 km/h, acceleration from 0-100 km/h and a 400m sprint. Sorry to say that I can't remember the figures listed. On one page there was a comparison of the windscreen water jets for each car, showing the area reached by the gets with a green highlighting. Naturally the Altis won that too. Interior space, headroom, handling, forward and rearward visibility, all saw the Altis best the Honda Civic. Leafing through it I was left thinking that although the Civic is a much nicer looking car, and has a much nicer interior look, the Altis seems far more practical. I guess it has to be, it is a Taxi after all. 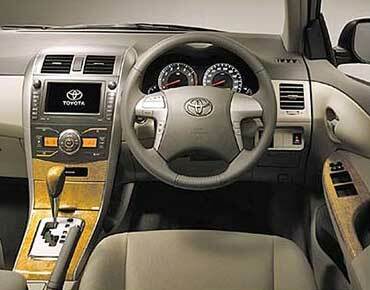 Toyota has also gone ultra conservative with the interior styling, electing to go for the least exciting materials that they could choose, and naturally (unnaturally actually) fake wood and fake chrome are used to make sure the old faithful Toyota Altis buyers are kept happy. Unfortunately the brochure/marketing folder was all in Thai, and was the salesperson's personal copy, so we have to wait a little longer for official images. But, if you are waiting for something exciting and different, with style, and contemporary interior design, then the 2008 Altis will do nothing to change your situation. Personally I like the exterior styling, but the interior is dull, and a very slight improvement over the outgoing model, which was very dull. Honda raised the bar for interior styling with the Civic, and remember the interior of the Civic sedan we have here in Thailand is a toned down version of the Civic hatchback. But even the sedan looks modern and stylish, while still retaining function and remaining ergonomically sound. Toyota would have needed to do something very special with the Altis to compete with the Civic on style, but they didn't do that, and they don't have to. The Toyota will outsell the Civic. Smaller engines, lower spec, drab and boring interior, take it or leave it styling, and arrogant sales staff will do nothing to put off buyers who have already decided that the Toyota is a better buy. If you have read everything up to this point, you'd be forgiven for assuming that I was about to say Civic, but I'm not. Given the choice I take the Altis. At the end of it all, when it comes time to buy a car, some factors matter more than others. Exciting styling will not be exciting after a year or so, but a large cabin space will still be as large in a year as it was when bought. Features that look cool in the showroom like steering wheel mounted gear leavers seem wonderful, until you find that you never use them, unless to show-off that feature to a friend, but the headroom for your tall friend sitting in the back will always be of value, and will impress him far more than you fiddling around with the gears. 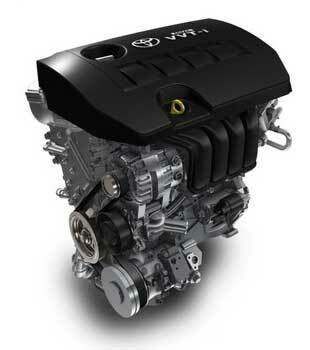 Related Update (26, Jan 2008): Dual VVT-i 1.8 in the US - 132 hp!